To date, a dueling tree has been the most requested target by MOA customers. So, after about three months of development and testing, we’re pleased to announce they are ready for purchase. The new target, model name Showdown, is built on the simple yet time tested design of “shoot it, and watch the bullet do the work”. There are no wear parts, no springs, and no welds on the paddles. The pivot points are welded into bolt on strips. 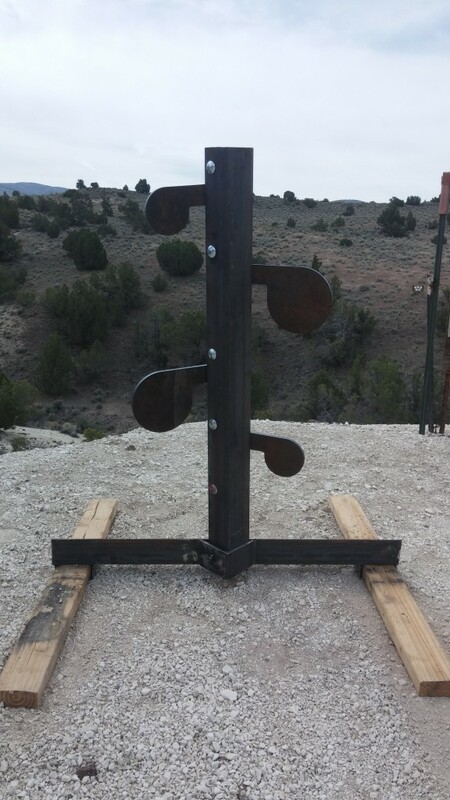 The Showdown is built out of 1/4″ mild steel angle iron, AR400 pivot points, and comes standard with four 3/8″ AR500 paddles. 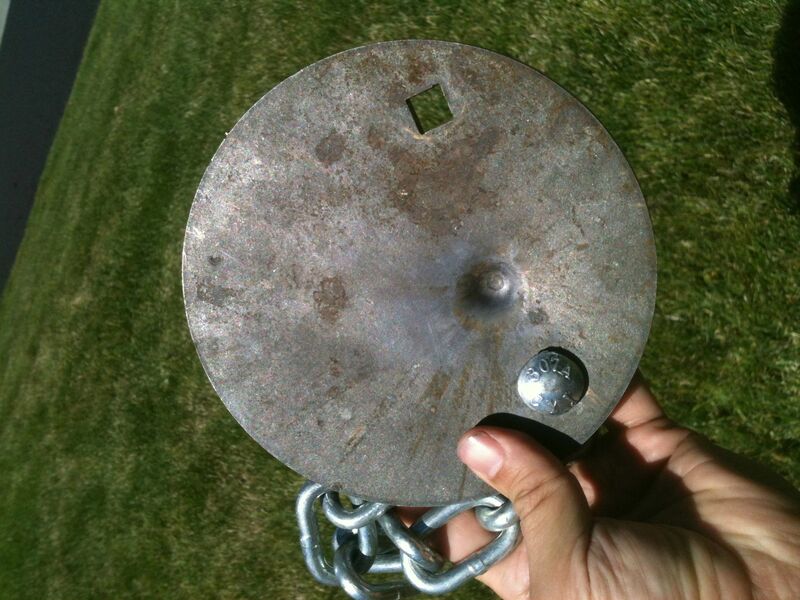 Six inch diameter paddles are standard, but four inch diameter “challenge” paddles can be swapped at no charge. 1/4″ AR400 rimfire paddles are available as well. The standard Showdown is rated for standard non-magnum pistols. The limiting factor is the trunk, not the paddles. To use with magnum handguns and centerfire rifle, the simple expedient of bolt on 3/8″ AR500 armor for the trunk gives you the ability to shoot intermediate and hunting loads at 150 yards, magnum rifle at 250 yards, and 338 Lapua at 350 yards, all using the same target system. Showdown is available as a complete product ready to shoot, a weld kit, and a do it yourself version, where you get the laser cut parts, and provide your own angle iron for the trunk, and build your own base, after welding the whole thing up. This is a follow up to my previous post How to choose the correct steel for your shooting needs. There are two primary ways that steel is affected by bullet strikes, pitting (cratering in the extreme) and denting. Pitting is material removal from the strike face, caused by super-heating the strike face. Think of an asteroid hitting the earth. The asteroid is insignificant in size related to the earth but it’s moving pretty fast. That kinetic energy is converted largely into thermal energy when the strike occurs. The thermal energy weakens steel surface enough to eject some of the steel. It also affects the temper of the steel, weakening it to allow future damage. 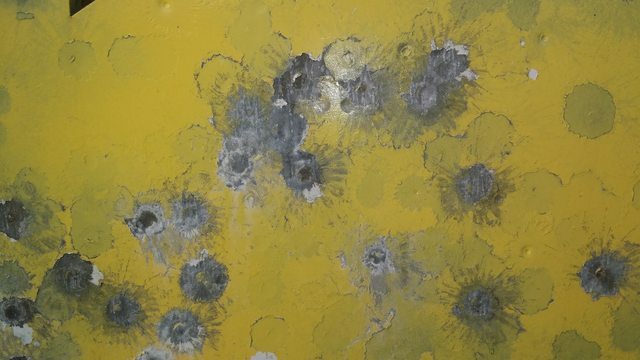 High velocity, low sectional density (small diameter), and hardened projectiles such as steel core and armor piercing all tend to cause pitting of steel targets. Varmint rounds tend to be small diameter and very high velocity, and can cause pitting and cratering far exceeding what you’d expect for something used to shoot rodents. Harder steel target surfaces resist pitting better than softer surfaces. For our purposes the Brinell Hardness scale (HB) is used for relative hardness. Per wikipedia, pine wood is about 1.6 HB, lead is 5-22 HB, depending on alloy, copper is 35 HB. Mild steel is 120-180 HB in my experience. Hardened tool steel, similar to what is used for AP core ammo, is 600-900 HB. Pure tungsten is 2570 HB. For target purposes, I use 400 HB (pistol) and 500 HB (rifle) abrasion resistant (AR) steel. Why abrasion resistant? Because at the 400+ HB hardness, typically the material is sold as industrial plate steel for uses that need abrasion resistance. It doesn’t hurt anything for our use, and it’s what’s available at a reasonable price. While the difference between mild steel and AR400 is pretty significant, the difference between AR400 and AR500 is less so, but still notable. It’s enough that you don’t want to use your AR400 pistol targets for rifles until you get several hundred yards out. The difference between AR500 and AR550 is barely perceptible. At 2570 HB, tungsten targets might last you forever, but it has a scrap price of about $15/lb (steel scrap is about $0.10/lb right now). Tungsten is about twice as dense as steel (0.54 lb/cubic inch as opposed to .28 lb/cubic inch), so an eight inch diameter, 3/8″ thick tungsten target would weight over 10 lbs, and probably retail for over $600. Denting or deformation is caused by exceeding the strength of the material. Total energy is useful if you want to cause denting or deformation. 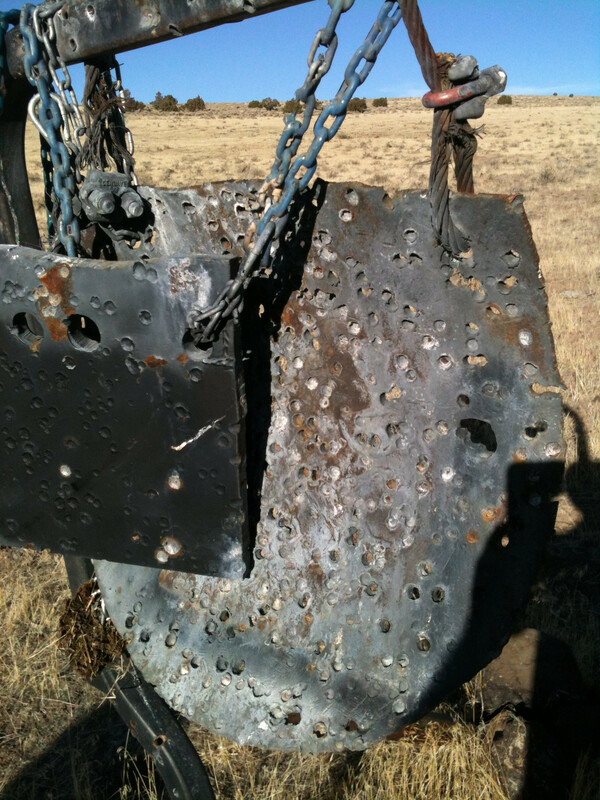 Heavy projectiles tend to dent targets, as opposed to pitting them. They tend to be slower than their light projectile cousins, the 168 grain .308 (2700 fps) as opposed to the 55 grain .223 (3200 fps). Thicker targets resist denting and deformation better than thin targets. Impact velocity, projectile hardness, projectile mass, and angle of impact are your factors that affect your targets, assuming the target isn’t the variable. The softer the projectile (no steel jacket, steel core, or AP), and the further away you are from the target, the longer that target will last. Total energy of impact decreases as you get further away from the target, due to drag in the air reducing your impact velocity. Angling the target reduces the energy absorbed as well. Make sure you always angle the target in a safe direction. In a practical sense, here’s what all this information means to you. If you’re getting pitting on your target, going to a thicker steel won’t help. 5.56×45 M855 is going to pit AR500 at 100 yards, even if you upgrade to 1/2″ or 1″ steel from your current 3/8″. The only way you’re going to stop the pitting is to stop using steel core M855, move target further away, or go to a harder target. If you’re denting your target, you’re in luck. You can go to a harder target (assuming you’re using mild steel), a thicker target (if you’re using a rifle), or simply move further away. It’s unlikely that you’re using a projectile that’s too hard or too fast if you’re denting instead of pitting the target. 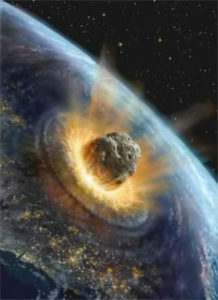 It is, however, possible to dent and pit (crater) a target at the same time. If you manage that, you’re doing something terribly wrong. That, or you need a medal for your creativity. I stayed at a buddy’s place this weekend, and he’s got some steel from me on his home range. One plate is an old piece of mild steel I scrounged for him, the other was an early prototype target for his department (he’s a deputy in CA). I took the opportunity to take a couple photos and write down my observations, because I typically never have mild steel on my ranges. If I’m going to shoot pistols, I’ll downgrade to 1/4 AR400. The targets have been up for about a year. It’s a pistol range, but occasionally a rifle sneaks onto it. When something other than a non-magnum pistol caliber is used on the range, he’s careful to make sure it only goes at the AR500 target. 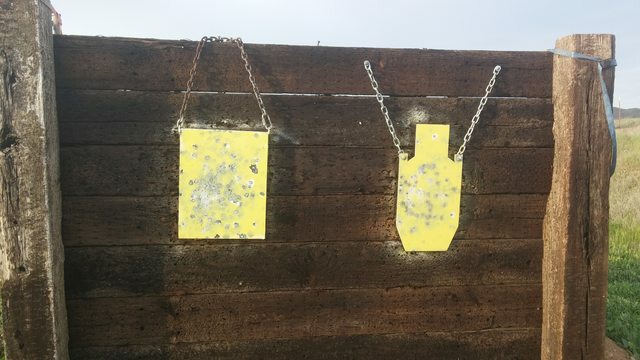 As a result, the mild steel target is holding up very well, but the difference between the two is obvious when you look at it close. I’ll probably be swapping out his mild steel target for more AR500 this summer, before the surface turns into a moonscape. 1″ mild steel rectangle on left is approximately 15×20″. The target on the right is an IPSC Metric less the D-zone, in 3/8″ AR500. Hung with 1/4″ chains against a railroad tie backstop (basically no swing). As of May 5, 2014, targets have been hung for about one year. A total of approximately 2,000 rounds fired down range, the majority of which are 40S&W. Closeup of mild steel plate. Visible impacts are all 9mm, 40S&W, and 45ACP. On this private range owned by a law enforcement officer, pistols are used as close as seven yards. MOA recommends no closer than 12 yards for pistols due to concerns of lead and copper jacket splashing back. Closeup of AR500. 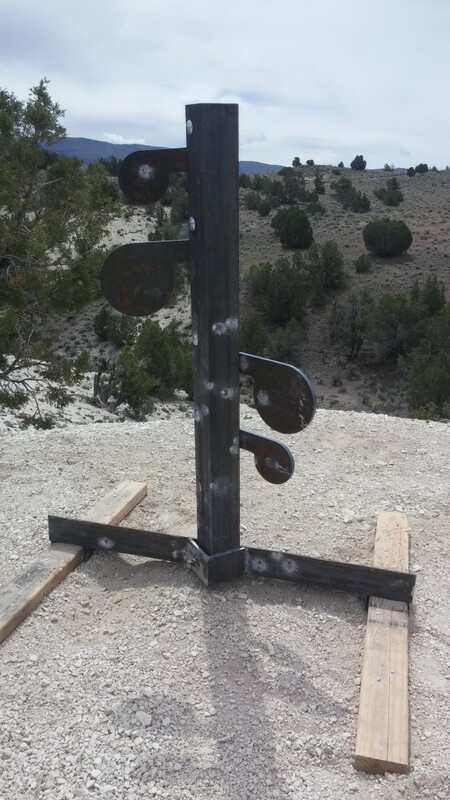 Visible impacts are from 5.56×45 at 75 yards and 357 mag from a 16″ barrel (lever action) at 25 yards. 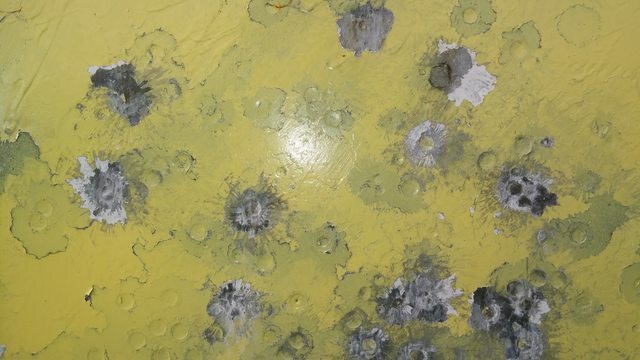 Places paint has been removed and repainted with no impact mark are from 9mm, 40S&W, and 45ACP. On this private range owned by a law enforcement officer, pistols are used as close as seven yards. MOA recommends no closer than 12 yards for pistols due to concerns of lead and copper jacket splashing back. There ya go. Thought you guys might enjoy this. As always, use common sense. I personally wouldn’t have mounted these the same way that my buddy did, there isn’t enough forward angle, it’s against a hard backstop so it can’t swing, and he shoots at it closer than I recommend. 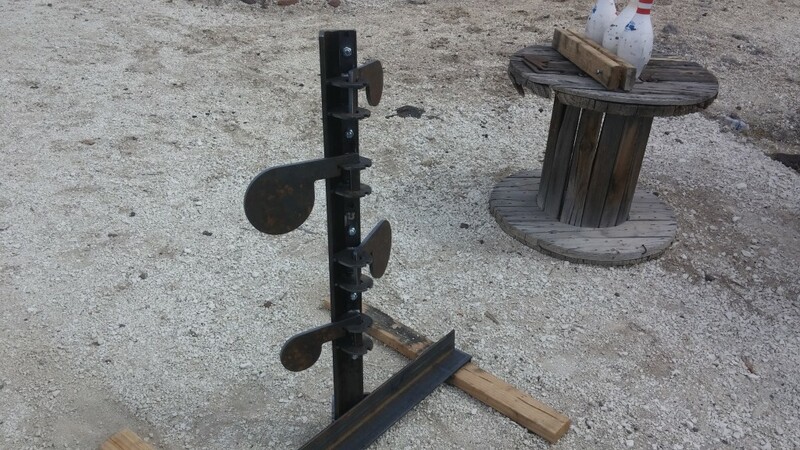 Plus, ewww, mild steel target?